Grief. It comes in all forms and fashions, because loss comes in all shapes and sizes. When we think of grief, our souls tend to focus especially on the devastating grief that accompanies death. Yet life is filled with daily mini-caskets—losses great and small. A critical word. A critical accident. Betrayal, rejection, a stab in the back. The terminal diagnosis. Separation and divorce. A church split. A prodigal child. Job termination. The list, sadly, goes on and on. The gospel. We know it has everything to say about grace for sin. But does the gospel have anything to say about grace for grief? We know that Jesus came to save sinners, but does he understand and care about our suffering? He understands. “He was despised and rejected by men, a man of sorrows and acquainted with grief ” (Isa. 53:3). Jesus intimately and intensely experienced grief, sorrow, loss, and pain. He cares. “Surely he has borne our griefs and carried our sorrows” (Isa. 53:4). The intensity of his sympathy made him feel your grief as his own—and then do something about it. He came to crush sin, Satan, and death so that one day there will never again be separation, suffering, sorrow, crying, grief, or pain (see Rev. 21:4). The author of Hebrews, who was steeped in Old Testament passages like Isaiah 53, adds his assurance of Jesus’ compassion, care, and comfort and of the gospel’s help, hope, and healing. “For we do not have a high priest who is unable to sympathize with our weaknesses, but one who in every respect has been tempted as we are, yet without sin. Let us then with confidence draw near to the throne of grace, that we may receive mercy and find grace to help in time of need” (Heb. 4:15–16). Jesus is not only a man of sorrows; he cares about your sorrow. Jesus is not only acquainted with his own grief; he is acquainted with your grief. And not only is Jesus acquainted with your grief, he is always with you in your grief—he walks with you in the cool of the day, and he journeys with you in the ups and downs of your grief (see John 14:1–6; 16:33). Grief is not a series of stages that you complete in some stereotypical consecutive order. Grief is a very individual process—a personal journey that we take with our personal suffering Savior. What Isaiah predicts and the author of Hebrews declares, the Gospels describe. From birth into a broken world, to death at the hands of a sinful world, and everywhere in between, the Gospels guide us on a grief journey with Jesus. The sorrows of Jesus appear on every page of the Gospels. Jesus lived, breathed, walked, and ministered in the midst of scenes of sorrow. And the Jesus of the Gospels is not only the caring Shepherd—which brings us amazing comfort. He is also the sovereign King—which instills us with amazing confidence. “Since then we have a great high priest who has passed through the heavens, Jesus, the Son of God, let us hold fast our confession” (Heb. 4:14). We entrust ourselves to him because he sovereignly shepherds us—guiding us to the green pastures of mercy, grace, and help as we walk through our valley of the shadow of death. When life is knocking us down, how do we hold fast? We hold fast by holding on to Jesus, who is holding us close to his heart. “He will tend his flock like a shepherd; he will gather the lambs in his arms; he will carry them in his bosom, and gently lead those that are with young” (Isa. 40:11). Jesus is a suffering Savior who is intimately acquainted with our grief. It’s normal to hurt. Jesus is a compassionate Savior who lovingly consoles us in our grief. It’s possible to find comfort in our hurt. Jesus is a healing Savior who compassionately speaks eternal truth into our earthly wounds. It’s possible to grieve with hope. Jesus is an empowering Savior who mightily enables us to comfort others with the comfort we receive from God. It’s supernatural to love in the midst of loss. 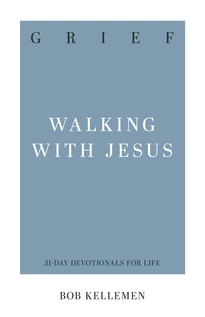 Grief: Walking with Jesus is now available for pre-order. This book is part of an exciting new series edited by Deepak Reju, and published by P&R Publishing, called 31-Day Devotionals for Life.